ANTHONY, Susan B. (1820-1906) was an American social reformer and women's rights activist who played a pivotal role in the women's suffrage movement. 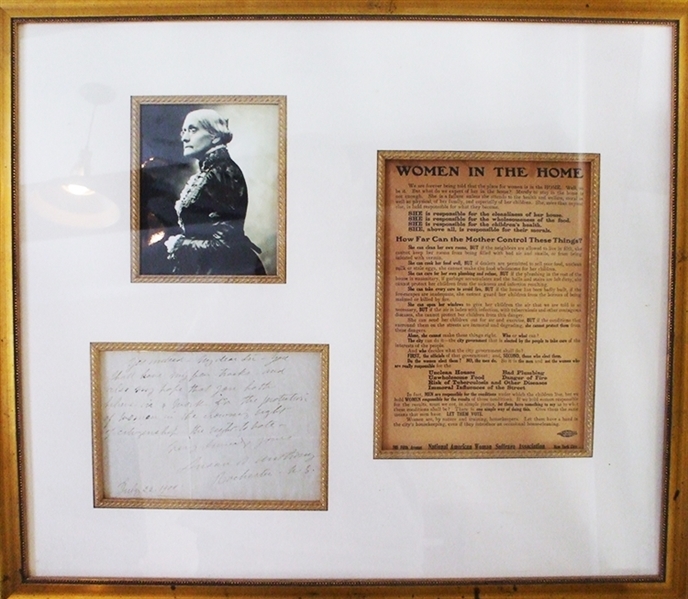 Born into a Quaker family committed to social equality, she collected anti-slavery petitions at the age of 17. In 1856, she became the New York state agent for the American Anti-Slavery Society. In 1872, Anthony was arrested for voting in her hometown of Rochester, New York, and convicted in a widely publicized trial. Although she refused to pay the fine, the authorities declined to take further action. In 1878, Anthony and Stanton arranged for Congress to be presented with an amendment giving women the right to vote. Introduced by Sen. Aaron A. Sargent (R-CA), it later became known colloquially as the Susan B. Anthony Amendment. It was ratified as the Nineteenth Amendment to the U.S. Constitution in 1920. Anthony traveled extensively in support of women's suffrage, giving as many as 75 to 100 speeches per year and working on many state campaigns. She worked internationally for women's rights, playing a key role in creating the International Council of Women, which is still active. She also helped to bring about the World's Congress of Representative Women at the World's Columbian Exposition in Chicago in 1893. When she first began campaigning for women's rights, Anthony was harshly ridiculed and accused of trying to destroy the institution of marriage. Public perception of her changed radically during her lifetime, however. Her 80th birthday was celebrated in the White House at the invitation of President William McKinley. She became the first actual woman to be depicted on U.S. coinage when her portrait appeared on the 1979 dollar coin. Autograph Note Signed “Susan B. Anthony” 1pp. oblong octavo, July 22, 1900, and reads in part: “...Yes indeed my dear Sir, you shall have my pen tracks and also my hope that you both believe in & work for the protection of women in the crowning right of citizenship the right to vote...” Fine condition.